There is not. There are a couple ways this could work, all of which result in your opponent being successful (provided they don't make a mistake). 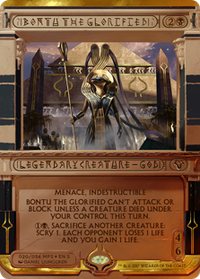 The first option they have is, when they have priority, tapping the Saprolings for mana and activating Bontu the Glorified 's ability. 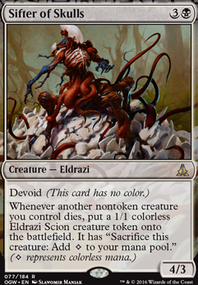 This would all be done before you gained priority and had a chance to cast Elder Deep-Fiend , so the creatures will have already been sacrificed and Bontu's activated abilities and Slimefoot's triggered abilities will already be on the stack. The second option they have is passing priority, allowing you to cast Elder Deep-Fiend . This would put Deep-fiend's triggered ability on the stack. 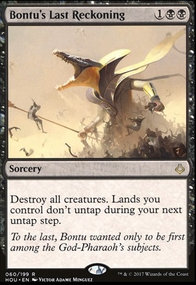 Priority would pass back to your opponent, who can simply tap the saprolings and activate Bontu in response. This would all be done before Deep-fiend's cast ability resolved. 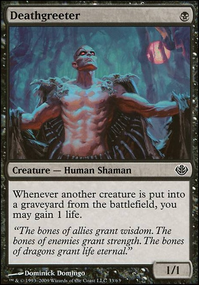 I play Soulflayer in a Hollow One shell, Power 4 is Ferocious, here are some general thoughts on Soulflayer. 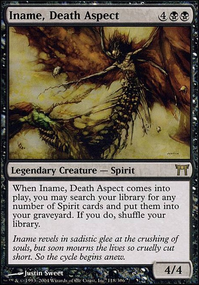 Ideally you want double strike, hexproof, indestructible, lifelink and flying obviously that number of keywords is a big ask, most of the time I'd settle for double strike, lifelink and flying, which puts Soulflayer in the answer this or die bracket. 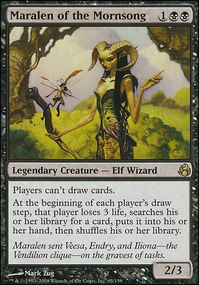 A nice way to deliver lifelink and flying is Chancellor of the Dross , your not going to play this card, but it has a minor upside if it's in your opening hand. 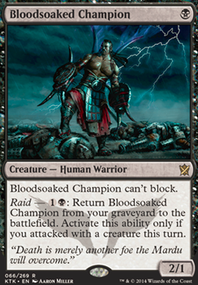 Double strike is off colour for blue / black, but Crypt Champion is a decent option for delivering it. 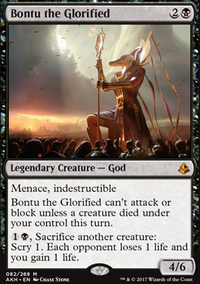 Indestructible I'd suggest Bontu the Glorified over Erebos, God of the Dead, it's a shame menace wasn't a keyword when Soulflayer was printed. Hexproof would be easy enough to enable with Striped Riverwinder . So that covers the keywords. 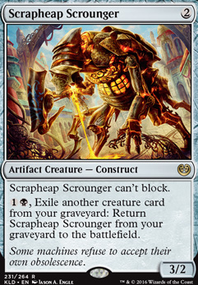 Your enablers; Returned Reveler, is nowhere near as good as Stitcher's Supplier which triggers when it enters play and when it dies. Magus of the Bazaar gives you more control over what goes to your graveyard than Armored Skaab. 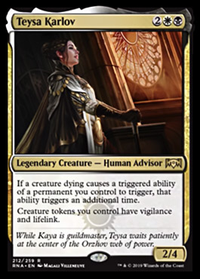 Lastly I'm not sure what Nykthos, Shrine to Nyx is doing in this deck, you don't really have a devotion sub-theme... Hope this helps, good luck brewing your deck. 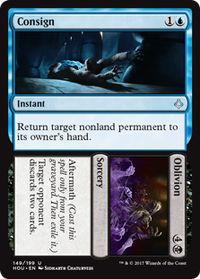 Dark Ritual : Quite a weak effect in EDH. Takes luck to line up with your more impactful cards. Not worth a slot imo. 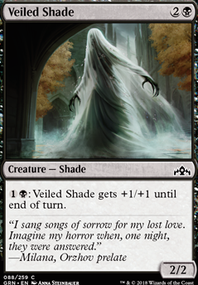 Launch Party , Bone Splinters , Diabolic Intent , Victimize : I feel that the creatures you run are heavy enough that sacrificing them is a big cost for you. You can easily use removal like Doom Blade , Go for the Throat as an alternative. I think you can try keeping to two wraths and see how it goes. You may not need that many. 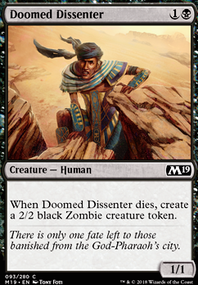 You have 19 basic land, in a deck which wants to cast cards which cost 7 mana, with some spells having and some . 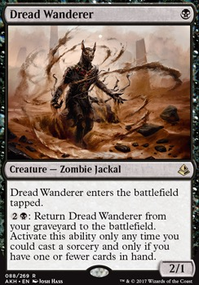 You probably need 22-24 land and you definitely need lands that can produce both your colours; Concealed Courtyard , Caves of Koilos , Shambling Vent or Isolated Chapel . 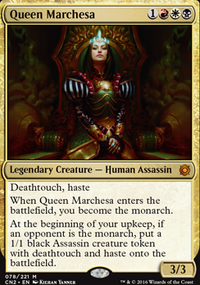 Lands might seem boring, but they are the glue that lets your deck function. 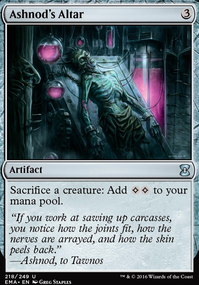 Don't skimp on your mana base, not only is it functionally helpful, it's the most reusable part of any deck. 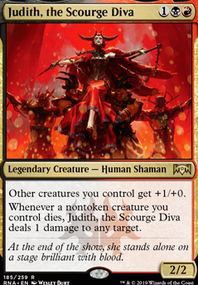 Probably the best creatures at the gain loss gag are; Viscera Seer , Blood Artist , Zulaport Cutthroat , Bontu the Glorified and Athreos, God of Passage . 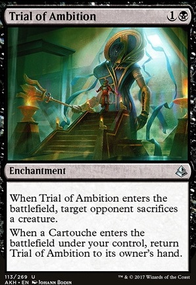 For spells they are; Altar's Reap and Tragic Slip , drawing cards is better than killing a creature and Tragic Slip is synergistic with your plan. 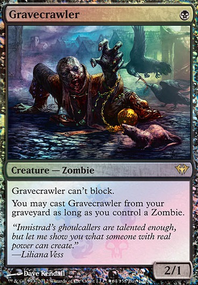 As is something like Bitter Ordeal or Mortician Beetle , Modern has a big pool of cards. 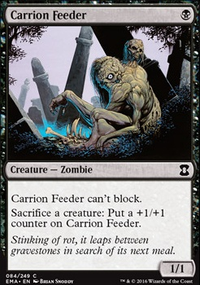 Unfortunately the cards recommended above Tendrils of Agony and Carrion Feeder are not Modern legal, if this is a casual only deck though they would be fine... I hope this is of some help, good luck brewing your deck. I know I said it before but Bontu the Glorified is too perfect for this list. 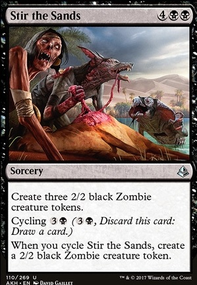 Personally I would cut 2 discard spells for 2 MB copies.